On the morning of September 11, 2001, sixteen-year-old Kyle Donohue watches the first twin tower come down from the window of Stuyvesant High School. Moments later, terrified and fleeing home to safety across the Brooklyn Bridge, he stumbles across a girl perched in the shadows, covered in ash, and wearing a pair of costume wings. With his mother and sister in California and unable to reach his father, a NYC detective likely on his way to the disaster, Kyle makes the split-second decision to bring the girl home. What follows is their story, told in alternating points of view, as Kyle tries to unravel the mystery of the girl so he can return her to her family. But what if the girl has forgotten everything, even her own name? And what if the more Kyle gets to know her, the less he wants her to go home? 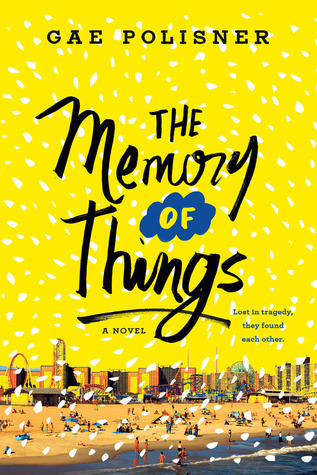 Gae Polisner's The Memory of Things tells a stunning story of friendship and first love and of carrying on with our day-to-day living in the midst of world-changing tragedy and unforgettable pain--it tells a story of hope. GAE POLISNER is the award-winning author of The Summer of Letting Go (Nerdy Book Club Best YA 2014, Teen Ink Editor’s Choice Badge of Approval) and The Pull of Gravity (2012 Bank Street Best, 2012 PSLA Top Forty, Nerdy Book Club Best YA 2011). She also co-hosts Teachers Write!, a virtual writers camp for teachers and educators. She lives in Long Island, New York with her family. This one was really interesting. I really enjoyed this one but wished that the falling words wouldn't have been in there it made the book very weird and broke up the story. This was a wonderful story that centered around the events of 9/11. But this is ultimately a story about hope and finding a way to go on. The characters were great and the story flowed well.